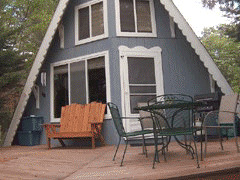 Enjoy an old-fashioned getaway in this private beachfront A-frame cottage on Little Bear Lake in Johannesburg, Michigan, just 30 minutes from Gaylord. This cozy three-bedroom cottage that sleeps eight is clean, modern and comfortable. The master bedroom has a queen size bed, bedroom #2 has a queen size futon, bedroom #3 has two twins and the family room has a sleeper sofa that will sleep two. Living room amenities include: 27″ TV with satellite, DVD player, VCR, board games and kids videos. The kitchen is fully equipped with range, microwave, coffee maker, refrigerator, toaster, blender and all cooking utensils. It also has a full-sized washer and dryer. The beach is one of the best on the lake! It provides quiet and seclusion, yet still being able to enjoy all water sports on this lake.